Annual Post-It show at Giant Robot 2. 2018. 8"x11" graphite on paper. 2017. Moniker Art Fair at Thinkspace Gallery booth. London, UK. 6"x8" graphite on paper. 2016. 'Interlude' solo exhibit at Thinkspace Gallery. Los Angeles, US. 4.5"x5.5" graphite on paper. 2016. 'Interlude' solo at Thinkspace Gallery. Los Angeles, US. graphite and acrylic on paper. 2017.
acrylic and graphite on paper. 2015. 12"x12". graphite and ink on paper. 2013. Scope Basel art fair with Thinkspace Gallery. Switzerland, EU. 12"x16". graphite and ink on paper. 2013.
hand colored intaglio print by Pressure Printing. 2013. 4"x4" graphite and colored pencil. 2015. Post-It Show 8 at Giant Robot 2. Los Angeles, US. 6"x6" graphite and ink on hand cut vellum. 2012. Jakarta or Bust art auction. Ink and graphite on hand-cut paper. 2010. 2.25"x3.5 ink on watercolor paper. 2012. 'Tiny Trifecta' at Cotton Candy Machine. New York, US. 3"x3" graphite and ink on paper. 2013. Tiny Trifecta show at Cotton Candy Machine. New York, US. 3"x3" graphite and ink on paper. 2011. 12"x24" graphite and colored pencil on hand-cut paper. 2011. Affordable Art Fair. Los Angeles, US. 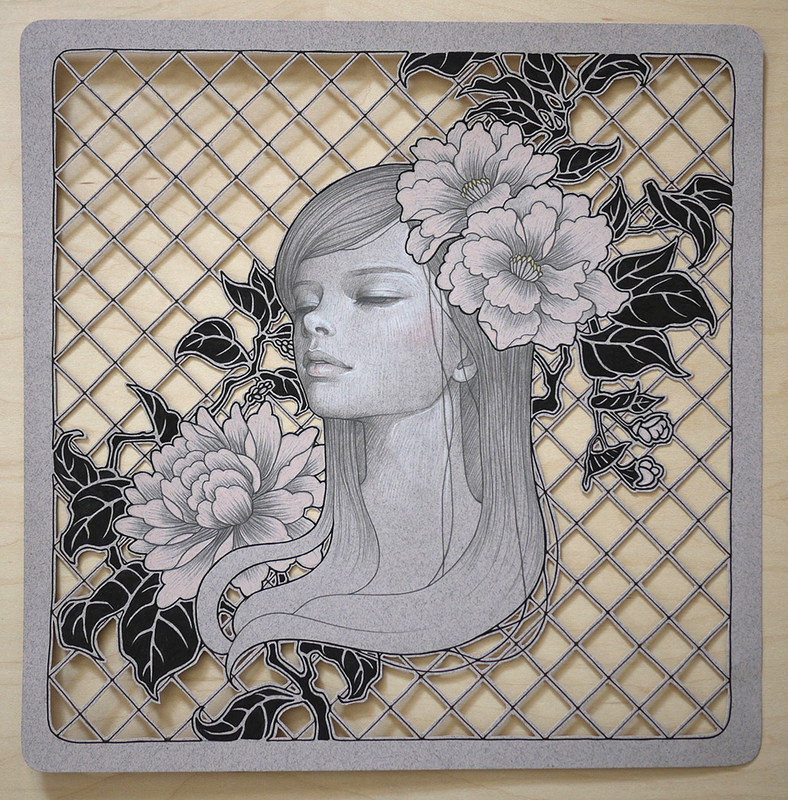 12"x12" graphite and colored pencil on hand-cut paper. 2011. 8"x12" graphite on paper. 2008.
intalgio print by Pressure Printing. 8"x10" graphite on paper. 2008. 8.5"x11" graphite on colored pencil on paper. 2008. 'Drawing Room' at Thinkspace Gallery. Los Angeles, US. 8.5”x11” graphite and colored pencil on paper. 2008. 10"x16" graphite on paper. 2008. 8.5"x11" graphite on paper. 2008. 18"x14" graphite on paper. 2008. 'Hajimari' at Jonathan Levine Gallery. New York, US. 15"x22" graphite on paper. 2008. 6"x7" graphite and ink on hand-cut paper. 2011. 'Restlessly Still' at Merryy Karnowsky Gallery. Los Angeles, US. 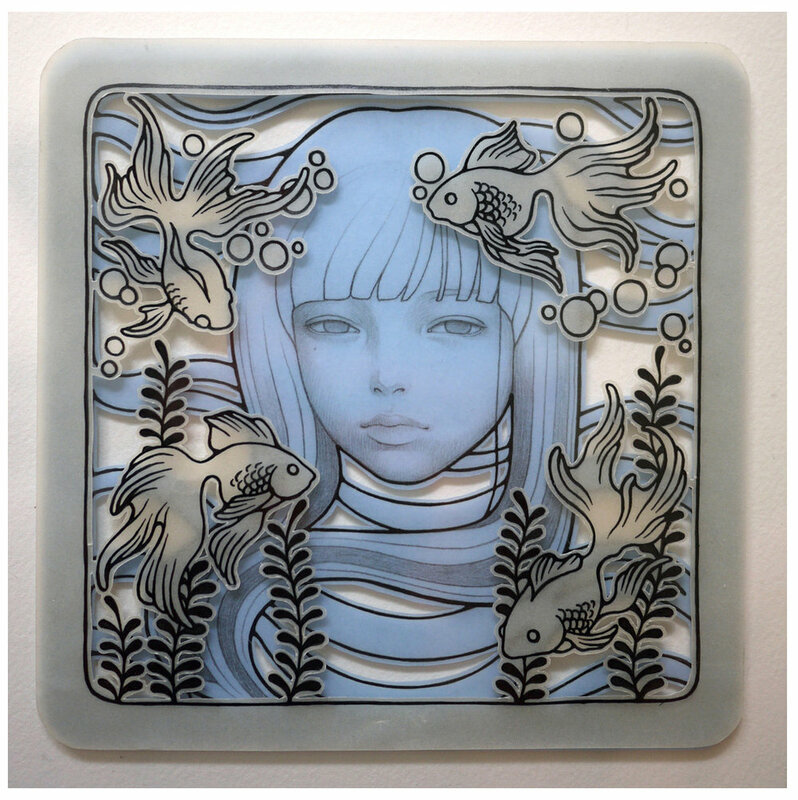 'Mayoi Michi' at Copro Nason Gallery. Los Angeles, US. 7.5"x9" graphite on paper. 2009. 12"x7" graphite and colored pencil on paper. 2008.